Ryanair, like its U.S. counterpart, Spirit, is synonymous with fees. After all, this is the airline that added a fee to check in online and implemented an even steeper “penalty” fee for customers who don’t. So it seemed only a matter of time before customers grew weary of the airline’s long list of extra charges. This past weekend, that moment finally came. A group of 100 Belgian students angry about a particular fee refused to exit a plane and had to be removed. According to ABC News, “The passengers became disruptive and refused to comply with crew instructions after a number of their group was assessed a ‘gate bag fee. '” The fee applies to carry-on bags that exceed the allowable carry-on size, and packs a €35-per-bag punch. The students were flying from the Canary Islands back to Brussels, and the flight was delayed three hours due to the disruption. It’s worth noting that Ryanair’s gate bag fee does not appear in its list of fees. Instead, customers learn of the fee by reading the carry-on-bag entry in the airline’s FAQ. Ryanair is actually pretty forthcoming about its fees—you won’t find such a detailed list of fees on many, if any, U.S. airline websites—but this is one Ryanair fee that could surprise customers. 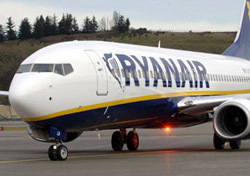 (Though this is Ryanair, so passengers should expect to find price tags attached to everything.) The gate bag fee is essentially a first-checked-bag fee—both are €35, though first-bag fees on Canary Islands flights are supposed to be €40, so the students actually got a €5 discount—so it’s not as if the gate bag charge is excessive. Well, not excessive in the context of Ryanair’s fees, that is. The airline’s first-checked-bag fee is nearly double the highest U.S. first-bag fee. In a statement, Ryanair explained, “Lanzarote police required the entire aircraft be offloaded, each passenger identified. Following further disruptive behaviour, the police required for security reasons that this entire group be refused travel. Do not think for a second that this incident will change Ryanair’s fee policy. Ryanair, like Spirit, is what it says it is: An airline that sells dirt cheap airfares and charges fees for everything beyond the seat. Customers can mutiny all they want, but it’s all sound and fury signifying nothing. This is Ryanair’s business model, and it’s not changing. No, for consumers put off by all the fees and gimmicks, there’s a far simpler and more effective method of protest: Fly a different airline.